Bless our leader, each and every one / The saving of all people waits in thy hand / We wish to serve you / Men and women serving selflessly / Loyal towards your destiny. May our aristocrat have a successful reign / Thy name rouses the hearts of people, persons / Persons and people / We offer thanks and praise for our aristocrat / Two leaders of name and valour / Thou gavest us knowledge and truth / We pledge our devotion, our strength and our might / May our noble aspiration bring / Generous fidelity / This land / The honour of dynasty. 194 national anthem redacted to omit all proper nouns, reassembled into 10 thematic movements, whilst maintaining poetic line structures. See Verses of a Nameless Land autonomous publication and audio installation. Patricia Reed, 'Verses of a Nameless Land' insert, in Who told you so?! - The Collective Story vs. 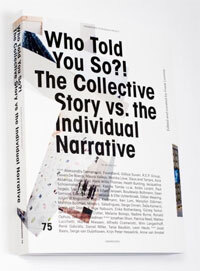 The Individual Narrative, ed. Freek Lomme (Eindhoven, NL: Onomatopee) 2013.